Lower School students at The Priory and The Prep celebrated the Chinese New Year on February 5 by participating in a Chinese New Year blessing at The Prep's campus. Excited students were treated to the cultural experience when Stacey Leong Mills, mother of The Prep second grade student Kamana'o Mills, arranged for his martial arts school to come to campus to give the blessing. Members of the Gee Yung Hawaii International Martial Arts and Lion Dance Sports Association arrived on campus with their lion costumes, drums and energy. Kamana'o – who has been doing lion dancing for the past two years – quickly became a celebrity amongst his classmates as they watched him get ready to participate in the blessing. The Chinese New Year is dictated by the lunar cycle instead of the calendar year. 2019 marks the Year of the Pig, an animal believed to be a symbol of optimism, enthusiasm and hard work. You can read more about the pig and the other Chinese animals and their symbolism here. "I think it's important to have a cultural awareness, especially for those who live in Hawai'i and have been here a long time," The Prep's Principal Winston Sakurai, Ed.D., said. "Students are learning about different cultures and what some of their traditions are and the contributions they make to this great place that we live in." Students were encouraged to feed the lion in order to receive blessings. The lions traveled from classroom to classroom in Jubinsky Hall and ate lettuce (symbolic of acquiring wealth) and red money envelopes – called lai see – hanging from the doorway of each class. admissions assistant Rachel Seton, who moved to Hawai'i with her husband in March 2018. 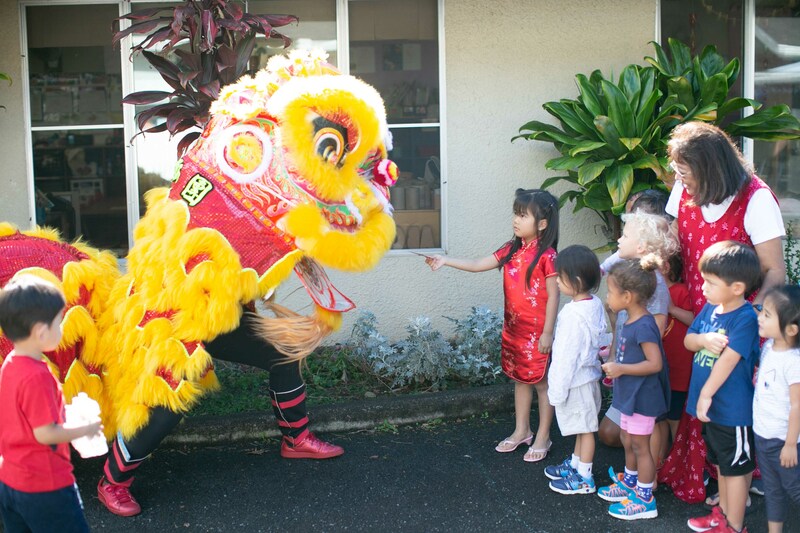 Meanwhile, over at Queen Emma Preschool, students were also treated to traditional lion dancing by the Asian Lion Dance team. Our youngest students fed lai see to the lions and enjoyed petting their fluffy tails as they danced by. Following the dance, each student received a sheet of bubble wrapping to jump on to simulate firecrackers. Cultural experiences and exposure to the traditions of our diverse student body align with our school's educational aims to appreciate diversity and understand our connectedness to each other. We are grateful to the parents and friends of St. Andrew's Schools who helped our students, faculty and staff welcome in the Chinese New Year. See more photos in our Chinese New Year 2019 photo gallery.